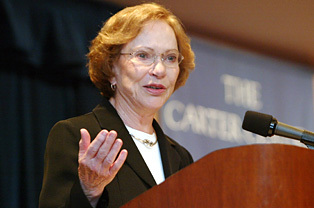 ATLANTA…As part of a partnership with the Qatar Foundation’s World Innovation Summit for Health (WISH), The Carter Center announced today two new recipients of the Rosalynn Carter Fellowships for Mental Health Journalism in Qatar. The fellowships launched in Qatar in 2016 with four journalism fellows. See below for journalist names and project topics. Over nearly two decades, the Center has awarded one-year fellowships to nearly 200 journalists, connecting them with resources and experts to increase the quality and accuracy of mental health reporting around the world. The project is currently in the United States, Qatar, the United Arab Emirates, and Colombia and was previously in New Zealand, South Africa, and Romania. The Carter Center provides training, educational materials, mentorship, evaluation tools, and technical assistance to WISH to develop a sustainable and tailored project in Qatar. WISH manages the project in Qatar and is responsible for the selection of journalists and adapting the project to meet the needs of the population in Qatar. Topic: Develop stories that shed light on postpartum depression. Topic: Explore the need and benefit for a support system for people living with mental illnesses and the impact the mental illnesses has on families.